Only ten sleeps till Tim and I go on our massive adventure overseas. And there’s so much to do. Like pack. And suss out the best method of casually running into Angela Lansbury in London so I can tell her she’s one of my heroes. And I’m going away for three days for work on Thursday. Hence, the mood here is distinctly…squirrelly. Between all that, and keeping an eye on the regrettably escalating disasters both local and international, we haven’t been to bed before midnight once over the last three weeks. I don’t know if that’s gasp-worthy or not compared to your own patterns, but 11-ish used to be the zenith of my awakeness on a regular day. Seems a harder to settle down and relax for its own sake now. However, I had a day off today, slept in, did some yoga, and fully intended to make this Mango Chutney. Unfortunately, in my absence last weekend the two mangoes had achieved a state of maturity not wanted for that recipe. So…I thought about sensible ways of using up these heavily ripe mangoes. Because of our trip, it has been on my mind that I need to use up anything perishable. I had a can of condensed milk in the cupboard which took from our work’s emergency survival boxes (because it had reached its best-by date, like, I was allowed to take it). Despite the fact that so many other options would’ve been easier – including just straight eating them – I found myself deciding, trancelike, that the most judicious, pragmatic option would be to use the mangoes in a sauce to go with a chocolate cake using this *clearly dangerous* condensed milk. See? Makes sense, right? I also kinda love the seventies vibes of the orange sauce against the chocolatey background. Some things to keep in mind – with all that condensed milk I wanted to counteract it with some good, heartily dark cocoa and chocolate. The initial melted mixture is unspeakably delicious, but you can kinda feel your teeth wearing away like rocks on the shore with sweetness if you sneak a spoonful, so the higher the cocoa solids the better. The mango sauce tastes really good if it’s freezing cold. And the spoonful of Shott Passionfruit syrup isn’t essential but if you’ve got some, you may well be as flabberghasted as I am about how distinctly passionfruit-esque it tastes. I bought it at the City Market a while back after tasting some – it’s so delicious. 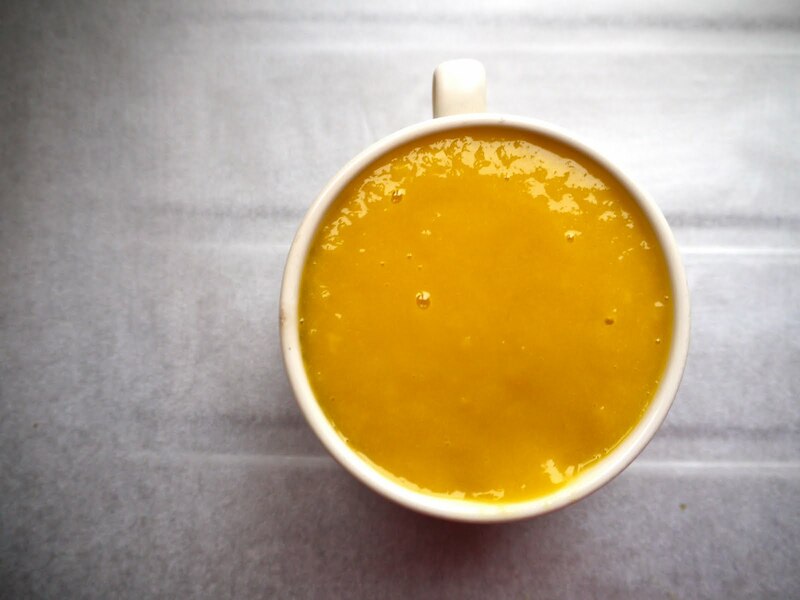 Don’t feel like this recipe is pointless if you don’t have any – it’s all about the mangoes, and the syrup just encourages its wild fruitiness. Vanilla extract, while different, would provide a similar and delicious function. Something about the presence of condensed milk made me want to include it in the title, you do as you please but this is what I’ll be calling them. Set your oven to 180 C/370 F. Line a square or rectangle small roasting tin – the sort you’d make brownies in – with baking paper. In a large pan, melt together the butter, sugar, water, chocolate and condensed milk. Sift in the flour, cocoa and baking powder, mixing carefully. Mix in the coconut and eggs. Tip into the tin, bake for about 30-40 minutes. A recipe by myself. Makes about 1/2 cup sauce. Use more mangoes if you want more. -Chop as much of the mango fruit off the stone as you can. Place in a food processor with the syrup and blend thoroughly till it’s looking good and liquidised. Tip in the custard powder-water and blend again. Scrape into a jug/container, set aside till you need it. I never really know what to do with sauces to make them look good – the spoonful that I draped over these brownies looked hopelessly drippy. So when in doubt: distract with a relevant garnish. In food as in life. So what do they taste like? Separately, both recipes shine – the slippery, fragrant, island-paradise taste of mangoes, elusive and slightly peachy and barely tampered with in this sauce. 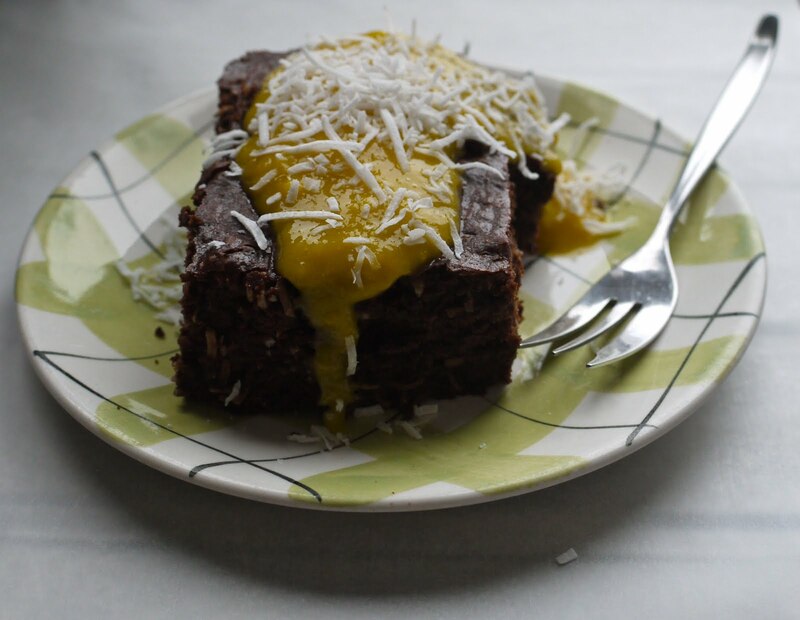 The condensed milk gives the brownies a melting texture punctuated by the strands of coconut, like fibres in a coir mat (Wait! No! That doesn’t sound nice at all!) and the combination of dark chocolate and cocoa gives a broad spectrum of chocolate flavour. 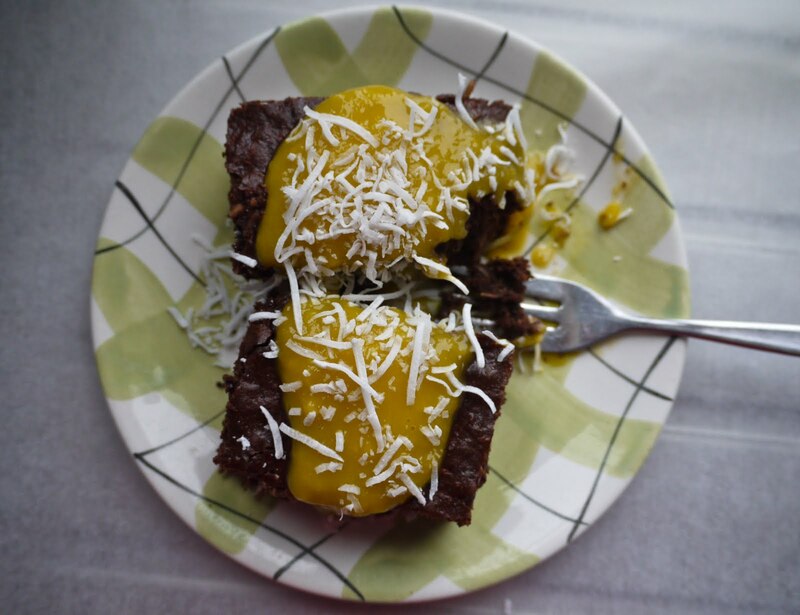 Together though, far out they’re good – the cool, fruity sauce cutting through the sweet, throat-filling brownie, the fragrant mango and coconut cosying up together in an extremely delicious manner. And I’m pretty sure they’ll disappear in a hot minute. So no need to worry about baking lurking round limply while we’re overseas. Speaking of limpness, I nearly fainted from bunchy nerves after booking Tim and I into Ottolenghi’s Islington restaurant for a ‘birthday season’ dinner on the 18th of April (the day after my birthday). So you know, my actual birthday was booked out, over a month in advance. Yotam Ottolenghi is such an exciting, inspirational food-creator – a recent addition to my heroes of cooking, a mighty team that includes Nigella Lawson, Aunt Daisy and Ray McVinnie. To actually eat in one of his restaurants is seriously thrilling. Just…imagine someone whose work you think is really, really awesome. Then imagine you get to experience it. It’s like that. Cole Porter’s Anything Goes from the musical of the same title. Thought on its breezy, timeless moxie today while watching a clip of the also formidable star Sutton Foster tap-dancing the heck out of it in rehearsals – seriously, watch this video. I kinda wish songs still had unnecessary preambles and lengthy dance breaks. Dum Dum Girls, He Gets Me High: makes me want to dance round like this. Next time: Well, I’ve still got those quinces to use. Anyone got any suggestions, preferably something that doesn’t involve too much sugar? So love the 70s vibe….and I reckon anything with dark ghana is good & the mango and coconut a nice fruity concoction against all that gooey chocolatey deliciousness. Ooops entered a comment under my class blog id by mistake… Looks like I can't remove the evidence. No problems, it could open up a whole new readership for us. 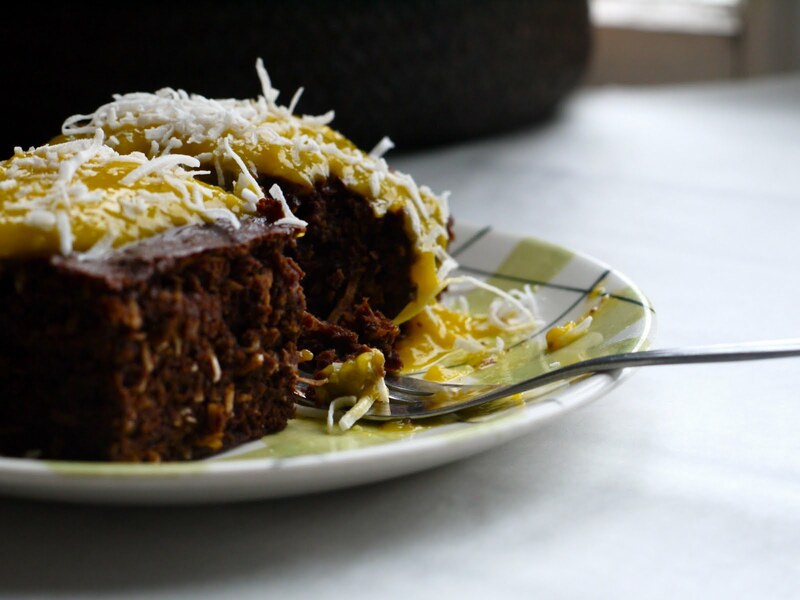 Love the Pasifika theme of mango and coconut via the medium of chocolate. So, custard powder does not have to be cooked? What a nice birthday gift you'll have 😉 Ottolenghi… ! Yes, chocolate and mango for a good intake of antioxydant. Seriously, this brownie with its stylish 70's colours is calling my name ! Weird, I also have been battling to get to bed before midnight. Had the same – must bake to calm down feeling last night with my apple pie. But gyaaarrrr! Yum. 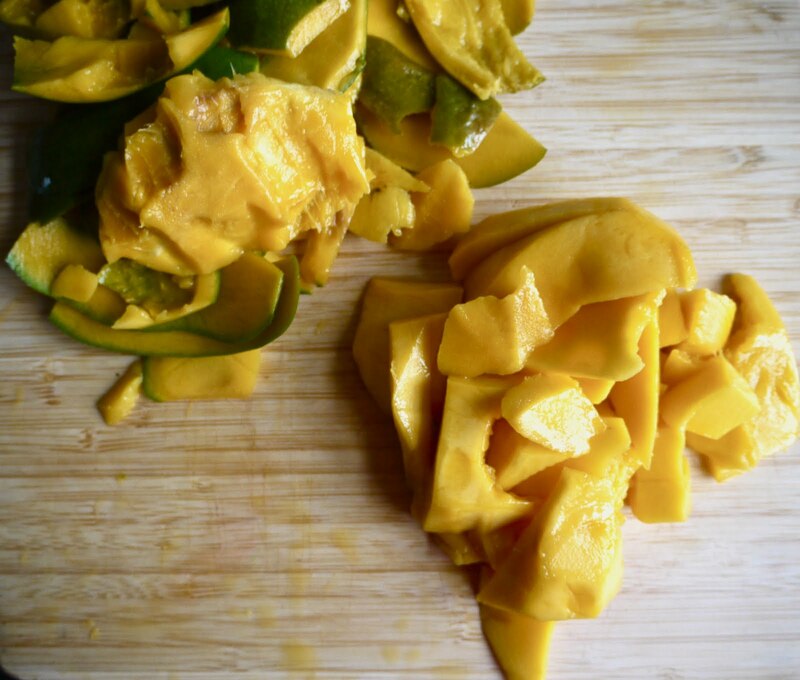 Fresh mangoes, I have been cranking these – they ripen up so quickly in our glasshouse-esque house. And hold me back from anything featuring condensed milk. Gorgeous! YUM, the mango looks great. How long are you kids going away for? You know, I actually have soy condensed milk so this could become vegan totally! Squee! But more squee is the tiny amount of time until you travel! OMG SO HAPPY AND JEALOUS FOR YOU! SQUEE! I'm also with you on the late night thing – not the best way to start a new job, oops! And hey, you and Mr Cake are twins! Well, maybe not, but y'know. I'm sure he'd love to go to Ottolenghi for his birthday too but since you've told me it's booked out (and a little bit of that whole we'll-still-be-here-in-Wellington thing) I guess we'll try something different. 😉 Bet it'll be awesome, though! Yum, the mango will be perfect with the sweet chocolate cake. Lucky you going to Ottolenghi, it will be a great birthday treat.